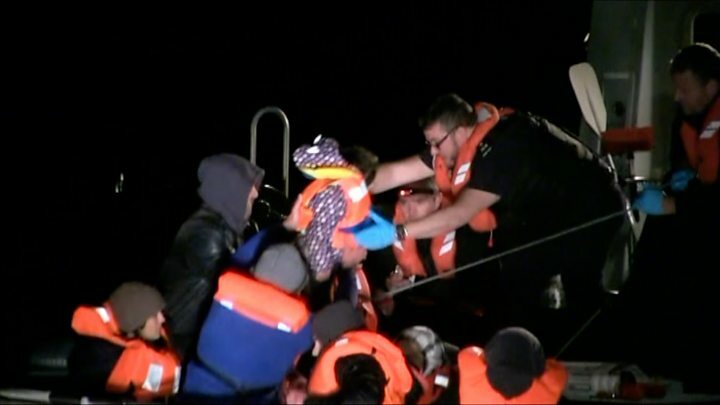 An 18-month-old child is among nine people rescued from a dinghy in the English Channel, the BBC understands. Kent Police were called at about 03:15 GMT after the 3m-long vessel was spotted by a fishing crew off Dover. The group consisted of one man and two families with four children between them, the Home Office said. Some 110 people have reached the Kent coast so far this month, most claiming to be Iranian. The coastguard is advising ships in the Channel to look out for small boats. The Home Office said a Border Force cutter and coastal patrol vessel were deployed and intercepted the dinghy with nine people on board off the Kent coast. A spokesman said: "The group consisted of one man and two family groups - father, mother and three minors; father, mother and one minor - all of whom presented themselves as Iraqi. "All are medically well and have been transferred to Immigration officials for interview." How has EU migration changed the UK? Another boat, with nine people on board, was also spotted off the coast of France, authorities there said. The Centre des Opérations Maritimes said the fishing boat was spotted by the British DFDS ferry Delft Seaways 7.5km west of Dunkirk at about 04:00 GMT and those on board passed over to French police. On Monday, eight people suffering from hypothermia were rescued from a boat in the Channel, French authorities said. Warnings have gone out from UK authorities about the dangers of taking small boats on the Dover-Calais route - the world's busiest shipping lane. Experts have said dinghies will not show up on the radars of larger vessels in the Channel, and crowded dinghies are not equipped to make the crossings. 26 November - Nine people including a child, reported to be 18-months-old are picked up from a 3m-long boat off Dover.